Ship wheel is made in the time-honoured way, from are-shaped sections of wood laid up in overlaps around turned spokes to form a circle. The cast brass centre bosses are individually tested for stress faults before assembly. Measurements are tip to tip 51 cm. Ship wheel is made in the time-honoured way, from are-shaped sections of wood laid up in overlaps around turned spokes to form a circle. The cast brass centre bosses are individually tested for stress faults before assembly. Measurements are tip to tip 40 cm. 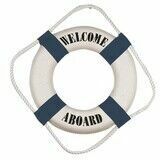 Fabric covered with rope adornment and welcoming You aboard, this blue decorative lifering measures: 25 cm. Nauticalia replica is dedicated to Royal Navy Captain John Campbell, who developed the instrument in 1757. Crucially his invention appeared at about the same time as the first accurate, portable chronometers - and the combination of the two transformed navigation from guesswork to science, saving countless lives at sea. This importance gave rise to the air of mystique which surrounds the instrument and its use, even in today's age of electronic wizardry. 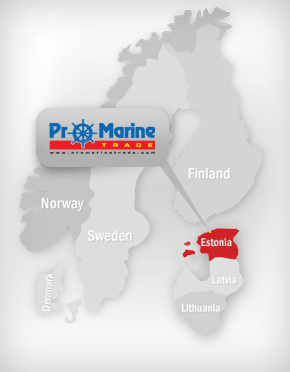 This quarter-size version is an irresistible "must-have" for the desks of instrument collectors and nautical enthusiasts. 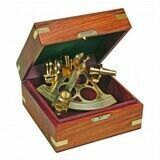 Sextant measures: 10 x 12 cm, box: 13 x 13 cm. Full-size vernier sextants were, in skilled hands, instruments of great accuracy, practicality and beauty - a joy to own and use, but also essential to the safety of the ship. Nauticalia replica is dedicated to Royal Navy Captain John Campbell, who developed the instrument in 1757. Crucially his invention appeared at about the same time as the first accurate, portable chronometers - and the combination of the two transformed navigation from guesswork to science, saving countless lives at sea. This importance gave rise to the air of mystique which surrounds the instrument and its use, even in today's age of electronic wizardry. Detailing is impressive, with hardwood handle and protective box, six shades of varying intensity, and a powerful telescope. Instrument measure: 20 x 17 cm, box: 25 x 25 cm. Ornamental diving helmets, made from solid brass and copper, recall the days when the pioneers of diving struggled on the ocean bed in equipment heavier than themselves. Nauticalia full-size replica, based on the US MKV model, is so complete that from the outside very close examination is required to detect that it is not an original. Diameter: 30 cm. 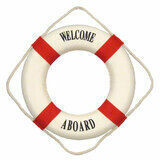 The wooden stand for diving helmet (product code 7122). Ship`s bell with wall bracket in solid resonant bronze. Bell`s diameter: 175 mm. Stylish ship`s bell made of brass with swiveling bracket. Diameter: 175 mm. 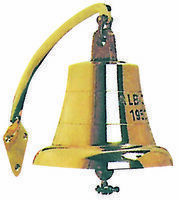 Stylish ship`s bell made of brass with swiveling bracket. Diameter: 100 mm. 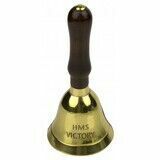 Ship`s bell, chromed brass with swiveling bracket. Bell`s diameter: 175 mm. 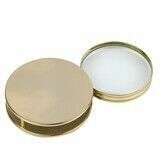 Made of polished brass, diameter: 8 cm, height: 12,5 cm. Solid brass bell lacquered for protection with a varnished hardwood handle. Deep engraved with HMS Victory. Strikes a lovely tone, reminiscent of butlers and days gone by. 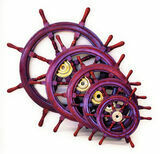 Diameter: 5 cm across the mouth, Height: 11 cm. 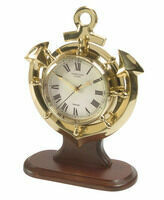 Decorative solid brass harbour clock on a wood plinth, height: 400 mm, width: 275 mm. This useful desktop accessory has functioning liner-style porthole made from chrome-plated metal mounted on black wood-effect base. Dimensions: 14 x 14 cm. 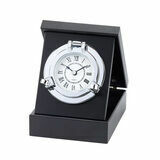 This useful Porthole Clock paperweight has a functioning liner-style porthole made from chrome-plated metal, mounted on black wood-effect base. Diameter: 9 cm, max. height (slopes for easy reading): 7,6 cm. Uses one LR44 battery, supplied. This useful Porthole Clock paperweight has a functioning liner-style porthole made from gold-plated metal, mounted on black wood-effect base. Diameter: 9 cm, max. height (slopes for easy reading): 7,6 cm. Uses one LR44 battery, supplied. This desktop weather forecaster operates on using the three most important influences on weather conditions - barometric pressure and trend, plus wind direction - to give a simple but remarkable accurate forecast. A solid, weighty, desktop version for the study. Measures: 135 x 90 mm. 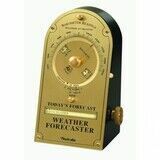 This little pocket forecaster, only 5 cm in diameter, is remarkably reliable for predicting general weather conditions in and around the British Isles in conjunction with a pressure reading from a barometer, and was a favoured instrument 90 years ago. 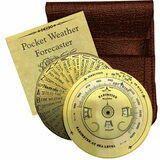 Based on established meteorological principles, it is easy to read and inexpensive. Made of solid brass with a clear acrylic centre disc, the detailed tables and readings are acid-etched and picked out in black paint. In leather carrying case with instructions. Portsmouth Portable Sundial Named in tribute to the historic naval dockyards in Portsmouth, focus of much of Britain’s maritime history, this sundial has an adjustable gnomon that can be set for latitude on a sliding scale; and the whole instrument oriented in the meridian by means of the magnetic compass in the base. A tiny spirit level and height-adjustable legs ensure that the instrument is used upright. Diameter: 10 cm, height folded 5 cm. Dry needle compass in a pocket watch-style brass case, supplied in a polished hardwood box. Compass diameter 4,5 cm, length of chain 46 cm. Box measures 7,6 x 7,6 x 3,8 cm. 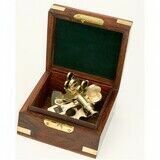 A smart little dry card compass in a brass case, housed in a fine rosewood box with lid. Works, but not for serious navigation. Diameter: 8 cm, Height: 2,5 cm. Simple but elegant paperweight - with brass lifering and contrasting copper rope banding detail. Diameter: 10 cm, weight: 425 grams. Nauticalia telescope has 12 times magnification with a 33 mm object lens, and the barrel is approximately 45 cm long fully extended. Tripod adjusts from 45 to 92 cm. 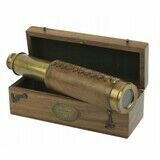 An antique-effect solid brass telescope, bound in leather and presented in a wooden box. It`s four drawers extend to 18 cm with 6 x magnification and good-quality 25 mm object lens. An ingenious way to crack a nut: place it in the vice and turn the ship's wheel until the shell cracks, in a controlled manner without damaging the kernel (in contrast to plier-like tools). Solid brass on wooden base. Height: 8 cm. An ingenious way to crack a nut: place it in the vice and turn the screw until the shell cracks, in a controlled manner without damaging the kernel (in contrast to plier-like tools). The integral dish even keeps the fragments together. 12 cm tall. 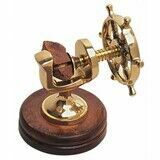 This traditional chart weight has a swing-out magnifying glass and is as useful today as it was in the days of the great maritime explorers. X 2 magnification. Diameter 6, 35 cm. Can be personalised.